During the week, Dave Lyman works as an engineer and owns his own business. But a few years ago he sensed a call from God that culminated in his ordination as part-time Associate Preaching Pastor at Covenant Christian Reformed Church in North Haledon. Perhaps this call grew out of Dave’s 35 years of involvement in leadership of various men’s ministries including a weekly men’s Bible study in Midland Park and NCS Bergen County. 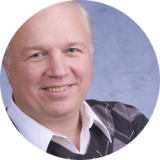 Today, Dave preaches regularly at local churches and men’s ministries; his website has reached over 60,000 people from over 110 countries around the world!